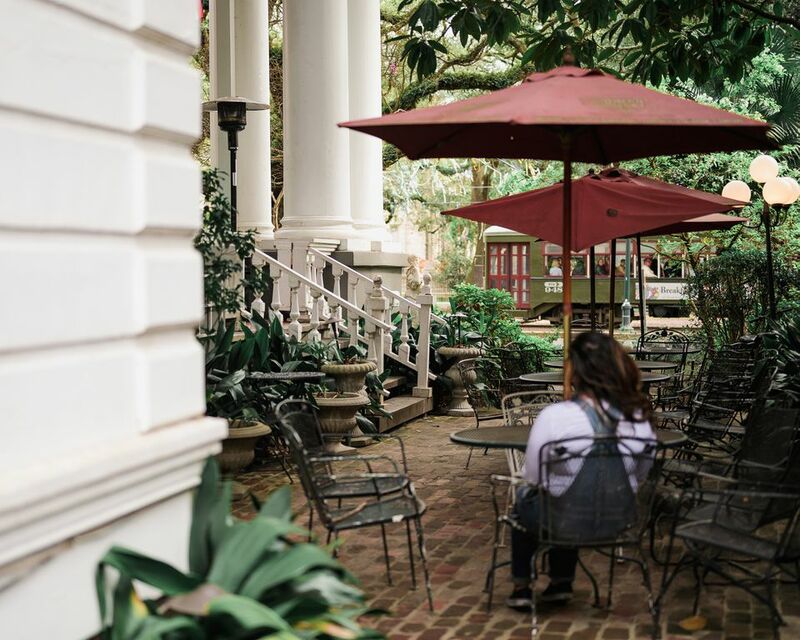 The glorious Garden District is one of New Orleans' most popular tourist spots, with an atmosphere very different from the hustle and bustle of the French Quarter. Even on its busiest days, the neighborhood's large, graceful mansions seem to invoke a hushed reverence among those who flock to see them. These mansions and the elegant landscaping around them are the main tourist attraction in the Garden District but there are other must-sees as well. Whatever your Garden District plans, make some time to just stroll around and admire the architecture and the marvelous details that make each mansion unique and don't forget to explore one of the famous New Orleans above-ground cemeteries. If you're in the French Quarter, hop on this National Historic Landmark (they say it's the only one that moves) and rattle and roll your way out to the Garden District. Starting at Canal Street, you'll roll through the Central Business District, the Arts/Warehouse District, and the working-class Lower Garden District before you hit the famous stretch of St. Charles Avenue mansions that you've seen in so many movies and TV shows. The streetcar actually makes its way a fair bit past the Garden District, into the historic suburb of Carrollton, but you'll probably want to jump off at Washington Street and stroll the few blocks in (just follow the pack) to see most of the other big sights of the neighborhood. Or better yet, relax and ride it all the way around, jumping off at Washington Street on the return trip. New Orleans' famous above-ground graves are found in several neighborhoods throughout town, but Lafayette Cemetery No. 1 is one of the easiest and safest to visit, not to mention one of the most beautiful and historic. There are entrances at both Washington Street and Sixth Street. If you'd like a guided tour, there are usually licensed tour guides (look for the city-issued badges hanging around their necks) hanging out near the entrances. They're legit and generally do a nice job of showing you around and explaining how things work, so to speak. Ask their fee in advance; typically a cemetery tour here costs $5-10. If you'd like to just wander without help, that's fine, too. You won't get lost; the cemetery is quite small and you can see the entrances from just about anywhere inside. Spend some time reading some of the gravestones. They reveal a lot about the people who are at rest inside. Located in a small shopping center that once housed the South's first roller rink, the Garden District Book Shop is one of the finest in the city and boasts author Anne Rice among its biggest fans. A cursory glance at the store's online calendar will give you information about interesting upcoming events, including book readings and signings with both local and out-of-town authors. Of particular interest is the shop's extensive selection of New Orleans and Louisiana-focused work. This always includes one or more books that contain directions for a self-guided walking tour of the neighborhood, so if that's of interest, stop in and pick one up before embarking on your own adventure. You can't miss this giant turquoise building on the corner of Washington and Coliseum Streets, but that's a good thing—you really don't want to miss it. Commander's Palace is the finest of the city's old-line Creole restaurants, and seamlessly blends traditional Cajun and Creole fare with contemporary technique and a farm-to-table aesthetic. You can't go wrong with a meal here. Dinners are the epitome of fine dining and jazz brunches are decadent and downright fun, but a Commander's lunch is the best gourmet meal for the price anywhere in the world. Two courses for around $20, plus 25-cent martinis, at a restaurant that is repeatedly included in lists of the world's finest? You'd be crazy to turn that deal down. Several blocks uptown from the Washington Street cluster, this venerable hotel sits grandly among the mansions on St. Charles Avenue. The Columns is found on many lists of New Orleans' most famous haunted places, and after you've had some luscious cocktails and nibbles on the front porch, you'll see why a ghost or two would want to linger in this place, too. This is a lovely place to stay if you're looking to book a room in this neighborhood. Even if not, stop by and sip an expertly-crafted drink and, as they say, "watch the world go by." There aren't many Garden District porches where the public is allowed to linger, so take The Columns up on their offer and enjoy yourself. Although the rooms are rather pricey, cocktails are affordable.